The TV series Mister Ed was broadcast from 1961 to 1966. The star was a cantankerous talking horse who would speak only to his owner, played by actor Alan Young, creating humorous situations. 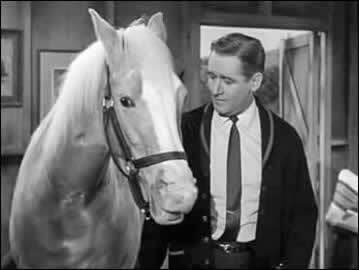 Mister Ed was played by trained show horse Bamboo Harvester; his voice was provided by actor Allan "Rocky" Lane. Studebaker was Mr. Ed's sponsor during its first syndicated season in early 1961, and co-sponsor during its first two CBS seasons (1961-'63). Both Ed and/or Wilbur "pitched" the new Studebaker Lark models in spots like this at the end of the show. The Addisons, who were neighbors, drove an Avanti. Studebaker Lark Skytop shown on the Mr. Ed set. 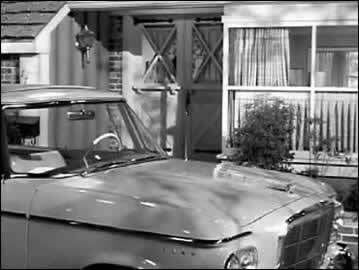 A Studebaker Lark on the Mr Ed set. Show horse Bamboo Harvestor with actor Alan Young.